St. Patrick’s Day is one of my favorite holidays. Actually, I think I love them all. I believe in celebrating each day — and if a certain day turns out to be a holiday too, well, all the better. But I also love the Irish culture and my Irish roots. But back to the Irish. I remember when visiting England and Scotland, before I knew all these roots, I had a strong pull to visit Wales and Ireland. Because of time and money, I wasn’t able to then, but those two places are still on my list. To celebrate today, my mom and I watched Celtic concerts (Celtic Woman and Celtic Thunder) on PBS and enjoyed nontraditional Irish fare — but green — spinach pizza and guacamole with chips. : ) Plus Irish soda bread and green tea earlier. I also brought out my inner child and looked for four-leaf clovers; although I didn’t find any, I’m sure they were there, hidden among a thousand. It’s nice to know that the treasures of life are always around, and that one day they’ll be illuminated, in perfect time, in perfect fashion. I’m just happy knowing there’s still more to discover. Peel and cut up one large, ripe avocado. Add lemon juice, minced garlic, sea or pink salt (use all organic ingredients). Use a spoon and mix it together. 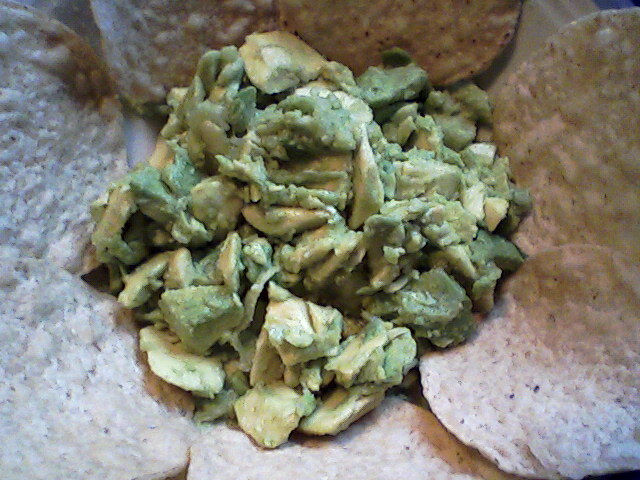 Mash up some of the avocado and leave some chunks. Dip into it with organic chips and enjoy! You definitely had your share of green food today. Guacamole is always a crowd pleaser…probably the most popular green food there is.